If you have a little land and are looking for livestock to raise, sheep are a good option for any size pasture. Whether your space is one acre or 300 acres, sheep will do well. You can raise them for their wool or meat or just for the pleasure of watching this fluffy variety of livestock graze. Sheep don’t require as much space as some larger livestock, like cows. A half-dozen sheep can happily live on just one acre of land, and a flock of more than 100 could be kept on 30 acres. Sheep should never be kept alone as they are social animals. A single sheep would get lonely, bored and potentially destructive if kept by itself. Having a few sheep together will keep them the happiest and healthiest. You can keep castrated males and females together, but rams should have a separate pasture until you’re ready for them to breed. Sheep are grazers and get almost all of their nutrition from the grass they eat. Before bringing home a flock of sheep, take the time to know what kind of grass you have in your pasture. Kentucky blue grass, orchard grass and tall fescue are varieties that can withstand heavy grazing from sheep. By having a mix of grasses -- some that do well in the spring and summer and others that do well in the winter and fall -- your land can maintain grazing year round. You can supplement a sheep's grazing diet with a high-quality alfalfa hay, which will provide a nutritionally sound diet. It's a good idea to rotate where your sheep graze. For example, a pasture of 30 acres could be sectioned off into three 10-acre sections. In these different sections you can grow different types of grass to provide forage all year long. Letting a section of pasture rest gives the grass time to regrow before the sheep begin grazing it again. 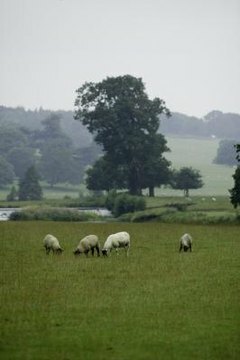 Any additional grass can be harvested as hay to either be sold or used as a supplement to the the sheep’s diet. Rotational grazing is also helpful in keeping the sheep from getting sick. The pasture will need perimeter fencing that is capable of keeping sheep in and predators out, like a barbed-wire or other livestock-grade fence. Electric fencing works well for sectioning off parts of the pasture and other interior fences. Sheep don’t need a lot of protection from the weather since they have thick wool coats. However, a large, open barn is necessary to house new mothers and their lambs. Each ewe and her lamb will need approximately 15 square feet of space. Living the Country Life: Thinking of Raising Sheep? In What Months Do You Shear Sheep? Are Sheep Cold When You Shear Them? How Do I Build Muscle in Sheep?